Researchers have found evidence that an extinct species of horse co-existed with people around Oregon’s Paisley Caves more than 14,000 years ago. The Paisley Caves complex, in an arid region of south-central Oregon, contains important archaeological evidence of early human presence in North America. Now, researchers at the University of Oregon’s Museum of Natural and Cultural History have found that a small, stout-legged horse species known as Equus conversidens — sometimes known as the Mexican horse, which once roamed parts of North America — coexisted with people around the caves complex more than 14,000 years ago. The study, published online ahead of print in the Journal of Vertebrate Paleontology, was written by paleontologist Edward Davis and archaeologist Dennis Jenkins, along with paleo-horse experts Brianna McHorse, of Harvard University, and Eric Scott, from California State University in Fullerton. Using discriminant analysis, a quantitative approach that relies on available data to predict the identity of unknown species, the authors examined horse toe fossils recovered during the museum’s 2009-2010 archaeological investigations at the caves. The study represents the first time such a replicable analytic approach has been used to identify horse species based only on toe bones. It also points to the first known occurrence of this horse species in Oregon. Jenkins is well known for his work at Paisley Caves, where evidence — including 14,000-year-old human feces — revealed one of the earliest human occupations in North America. A fossil from a now extinct small horse found at Oregon’s Paisley Caves. 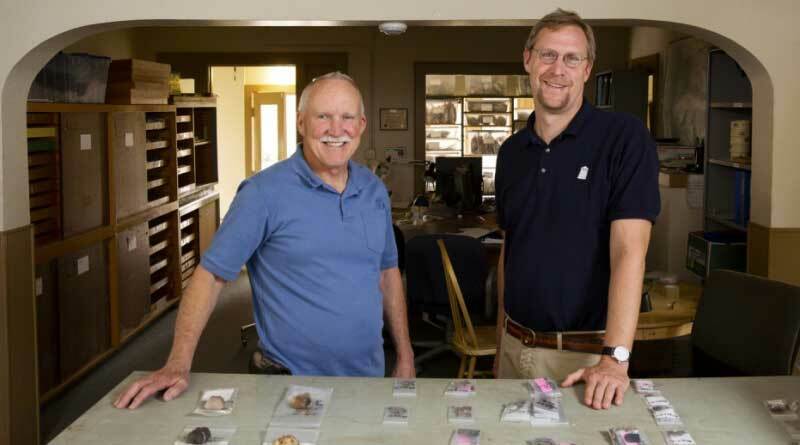 When Jenkins and his team unearthed horse remains at the site, it caught the attention of paleontologists interested in Pleistocene mammals, including Davis, who manages the museum’s Condon Fossil Collection. “We knew that horses were around at the same time as the first Americans, but we wanted species-level information about those horses,” Davis told the University of Oregon news website, AroundtheO. That’s when Davis and Jenkins turned to Scott. A curator at the John D. Cooper Archaeological and Paleontological Center in California, Scott is an authority on ice-age horses and maintains large data sets on extinct species’ remains from sites around the Western United States. Davis continued: “Eric was scheduled to speak at the museum’s 2011 Darwin Lectures, so we asked him to measure the toe fossils while he was here in Eugene. Airport adventures aside, Scott made it to Jenkins’ lab, where he examined and measured the fossils. Soon after, the three decided to embark on the collaborative study and recruited McHorse, then an undergraduate student working in the University of Oregon’s Vertebrate Paleontology Lab, to their research team. The approach the authors used in the study unlocks the potential for toe bones and other postcranial remains to help tell that story, giving researchers a clearer picture of how ancient ecosystems have changed across time and space. Fossils, feces and other finds from Paisley Caves will soon be on public view at the university’s Museum of Natural and Cultural History. The museum’s cultural history hall, Oregon—Where Past is Present, will reopen on November 5. It will feature enhanced artifact displays, touch-screen technology and an all-new section titled Paisley Caves and the First Americans.